ZP Gadochiroli Health Department (Arogya Vibhag, Zilla Parishad Gadchiroli), Gadchiroli Published Job Notification for District Monitor & Block Monitor Posts. 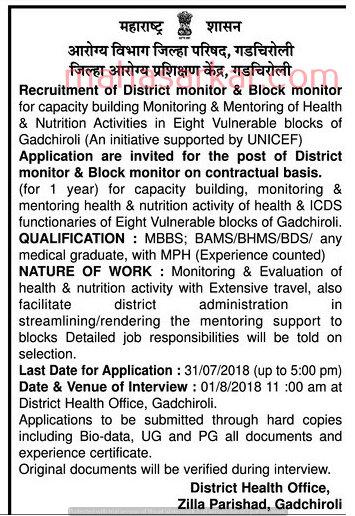 Candidates who wish to apply must look at ZP Gadochiroli Health Department District Monitor & Block Monitor Recruitment 2018. Eligible candidates can apply Offline before 31-07-2018. Education Qualification: MBBS; BAMS/BHMS/BDS/ Any Medical graduate with MPH. Interested & Eligible candidates can send their application along with all the necessary documents and testimonials to District Health Office, ZP Gadochiroli, Gadochiroli. Then attend for walk in interview along with all the original documents addressed at District Health Office, ZP Gadochiroli, Gadochiroli. Starting Date, Last Date to Apply Offline at Arogya Vibhag, Zilla Parishad Gadchiroli which candidates should be remembers as follows.